PINGLE has proudly served customers for more than 20 years. They are a Chinese manufacturer that is committed to the development, production, distribution, installation, and testing of flour milling machines. Their main products include the roller mill, square plansifter, purifier, multi-storey flour milling plant, and the steel structure flour milling plant. Additionally, they can provide stand-alone machines in the 9 to 1,000t range, which include popular selections such as the grain pre-cleaner, grain cleaning equipment, flour milling machine, flour processing equipment, maize processing equipment, and conveying equipment. 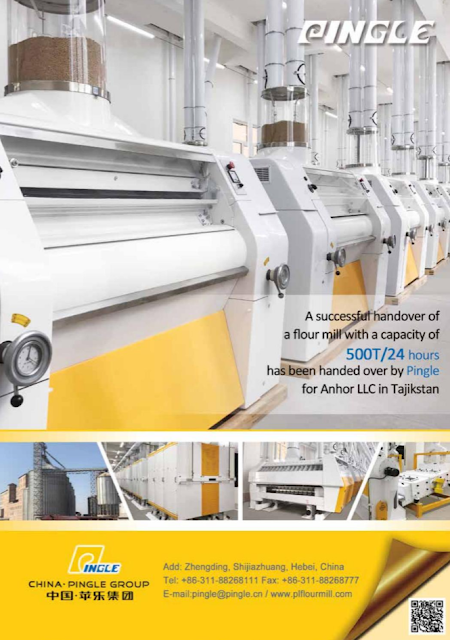 Also available are turnkey projects for flour milling plants with capacity ranging from 100 to 1000t. Their technical solutions and high performance machinery are implemented worldwide for the fine processing of wheat, maize, and other types of cereal grains. Pingle have a staff of 800 employees, of whom there are more than 50 technical personnel. These technicians are expert in fields such as mechanical structure, processing technology, automated control, and production flow. Their dedication and ingenuity allow the introduction of new products whilst providing upgrades for existing lineups. Product diversity and sincere services have distinguished Pingle as a leading domestic supplier. Their sales revenue has exceeded 150 million RMB for three consecutive years. Pingle have passed the ISO9001:2000 Quality Management System certification and established a complete quality assurance system. In 2009, PINGLE products were distributed worldwide across 32 countries and regions including Egypt, Ethiopia, India, Brazil, Australia, etc. As a mature and responsible enterprise, Pingle strive to provide customers everywhere with satisfying products and attentive services. For more information visit the Pingle website, HERE.